I have not been reviewing products for quite some time already. Sorry for the MIA. 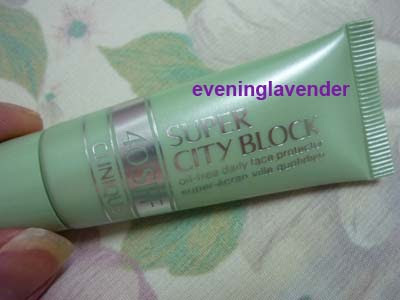 Here is to share with you my thoughts on Clinique SPF40 Super City Block after almost finishing the 15ml sample. A lightweight daily moisturizer that provides a high level of protection against sun and environmental damage. This product is oil-free and non-acnegenic. I have a 15ml sample from GWP. I used this Clinique SPF40 Super City Block quite regularly and am quite happy with the texture. It has a slight tint that blends well with my skin color. It is not oily upon application. After 2 hours my skin starts to shine but it was not super oily. In terms of oil control, I would say it is not the best sunblock that I have tried but you must know that I have very oily skin. Therefore, for normal to combination skin person, you would love it. As hardly use liquid foundation, this tinted sunblock is quite handy for me when I want to have some light coverage. Overall, I like this product because a 15ml sample tube lasts me quite a while as I only need a small bean size (Red bean /Adzuki bean) to cover the face and neck area. Have you tried this sunblock before? Do you like it? Pls share what is your favourite sunblock.